Trigger finger effects woman more than men and usually between the ages of 40 – 60 years old. Using ice, gentle stretching and massage to the nodule can usually reduce the symptoms significantly. If you have a trigger finger, attempt to move it to full extension slowly. Forceful pulling will irritate the tendon nodule further. Using a splint to prevent finger flexion can help to reduce the inflammation. Seek the advice and treatment from a Physical Therapist if you have the symptoms of a trigger finger. If your finger or thumb catches or locks in bent position, you could be suffering from trigger finger. This common condition can develop when people whose jobs or hobbies require repetitive finger and thumb for movements. It also commonly affects people with conditions such as rheumatoid arthritis, gout or diabetes. People suffering from trigger finger may experience the finger(s) getting “stuck” in a certain flexed or bent position. Trigger finger can result from tendon damage. Finger movement relies on a group of muscles that originate either near the elbow (extrinsic) or in the palm area of the hand (intrinsic). 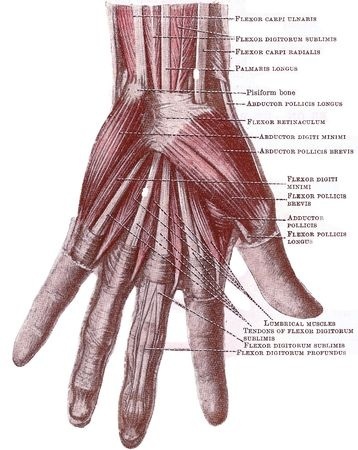 Extrinsic muscles have very long tendons that begin to course their way from the distal portion of the forearm through the palm aspect of the hand and make it to varying parts of the different fingers and thumb. When the tendon moves it slides through a tight tunnel or tendon sheath that extends the length of the finger. Overuse can cause tendon damage, causing tendinitis and pain. In severe cases the tendon can thicken, forming a nodule at the “mouth” of the tendon sheath tunnel. This makes it difficult time to slide through, so the tendon gets “stuck” in a flexed position. This is known as a trigger finger. The person suffering from the trigger finger symptoms might experience a “popping” sensation when the nodule passes through the mouth of the tendon sheath tunnel. The nodule is usually painful to palpation or touch. The most common cause of trigger finger is the extensive use on one’s hands. Repeated grasping of objects during work, sports or hobbies can lead to the development of the finger flexor muscle tendinitis and nodules. People with diabetes and rheumatoid arthritis experience trigger finger symptoms more frequently than those who do not suffer from these conditions. Women who are between the ages of 40 and 60 years old suffer from trigger finger more often than men of the same age groups. Normally a doctor will need to examine the affected finger. Initially, treatment focuses on reducing the inflammation and pain using the standard approach to treating any other form of tendinitis. This begins by applying ice, heat, and massage; doing gentle exercises; using a brace; and taking a NSAIDs. If this is unsuccessful, the doctor might give the person a steroid injection and refer to them Physical Therapy. The Physical Therapist introduces gentle exercises to help increase blood flow to the tendons. The exercises help to “re-align” the new tendon fibers as they heal from the tendinitis condition. Massage and stretching will begin to reduce the size of the nodule and restore the normal gliding action of the tendon. The therapist might use various modalities such as ultrasound, laser, electrical stimulation, ice massage and iontophoresis to reduce the inflammation in the tendon. In the worst case scenario, the surgeon has to perform a minor surgery and “open” the mouth of the tendon sheath which makes it easier for the enlarged nodule to pass through it. Physical therapy following surgery is geared at reducing the size of the nodule and restoring normal motion and strength of the finger flexors. Trigger finger is a common condition that can effect people who uses their hands extensively. The nodules that form in the tendon tissue can become large enough that they do not pass through the mouth of the tendon sheath tunnel. This condition with symptoms of pain on the nodule and restricted motion of a given finger with a possible “popping” sensation as the finger moves into full extension can usually be successfully treated with Physical Therapy. Therapist if you have the symptoms of a trigger finger.